Today marked a milestone in our progress: The first motorized movement of our robot chassis. Several of the students got a feel for the controls using two joy-sticks coupled to the laptop that interfaced with the robot. We finally got our parts kit on Thursday and there has been a great deal of progress since then. There are still many open design questions regarding autonomous portion of the competition (The robot figuring out what to do on its own) and for the actual mechanism for getting the ball and scoring points. We still don’t have our KoP so everyone divided up into sub-group (Brian calls them “fire teams”) to further plan and develop the design of the robot. Brian started us off with a brief video covering the electronics of the robot and then asked the electronics fire team to begin planning the layout of components. 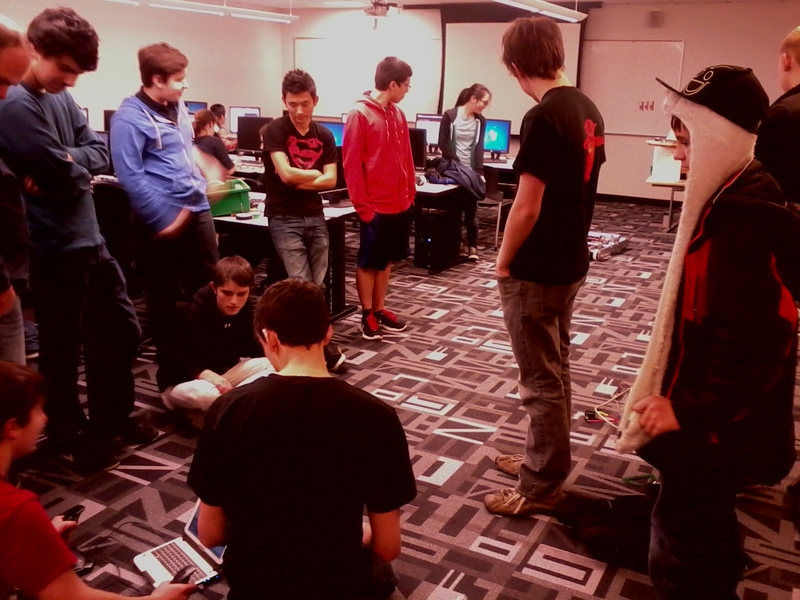 The programming group met separately (shown in the foreground of the picture) and quickly built a scale mock-up of the field, a white-box of the robot and included all the physics and controls to move the robot around the field. At the upper right you can see L& E’ s own Ian, Bobby and Ian’s dad working on a team logo. Our team also worked on dismantling last year’s bot so that we could have all the parts available for the electronics team to do the layout. The KoP should be here early next week and we can begin construction in earnest. Bobby has signed up to be a part of the chassis assembly team so he’ll have a lot to contribute once the parts arrive. 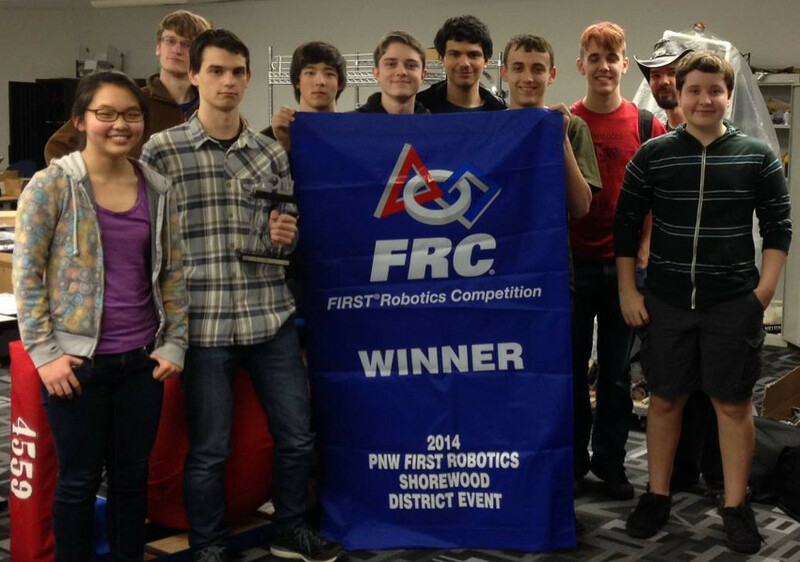 Some of the DigiPen students have created a team blog site similar to this one at https://firstrobotics.digipen.edu/ . You are invited to contribute ideas, observations and thoughts about the project on this site. We had our first organizing meeting of robotics club today and it was an amazing success. The students not only organized themselves into sub-teams, they also discussed strategy, design and the ordering of some more parts. In addition there was heated discussion about the overall design of the robot. It was quickly decided that our robot would not put anything in the air and would focus on blocking the opposing team’s scores and achieving points by pushing the ball into one of the corner goals. The basic plan calls for lowering a cross-bar over the ball and then activating a couple of motor-driven wheels at the top of a cross bar long enough to lift the ball off the floor. 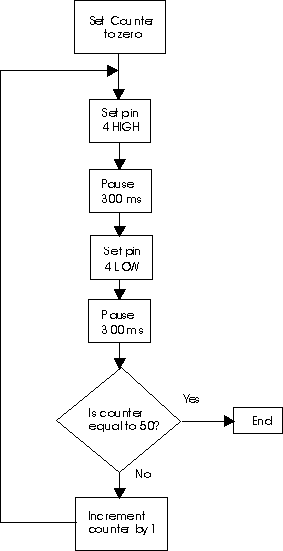 The cross-bar would pivot from the center of the robot in order to allow it to capture balls from the back or the front of the robot. There was a lot of discussion about having 8 or 6 wheels and which should be powered. The club decided that there should be 6 wheels for better traction when blocking opponents and that they should only be 4″ to allow as much room as possible in the robot’s chassis. The Kit of Parts (KoP) should be arriving soon and we can begin actual construction. The Washington FIRST robotics competition (FRC) was officially launched this morning with the nation-wide broadcast by NASA of the design of the game and an overview of the rules. 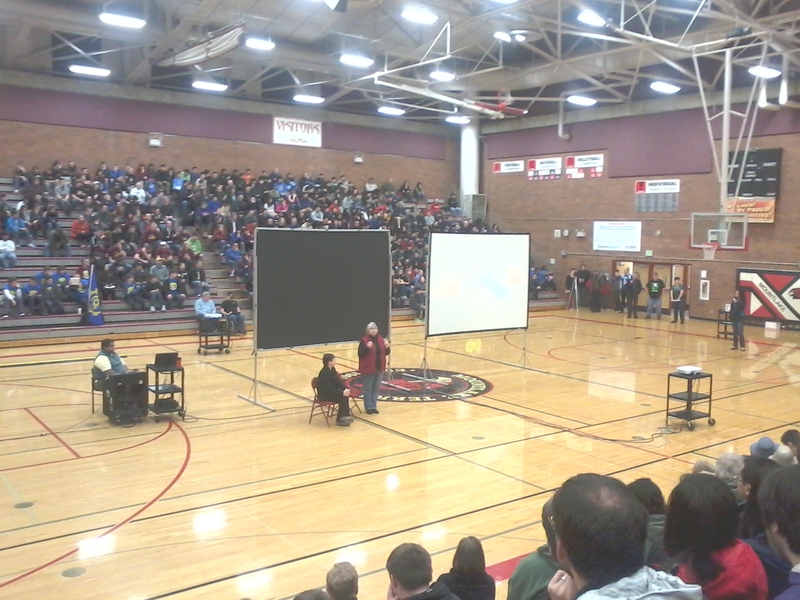 We met in the gym of the Montlake Terrace High School where they announced that our region now has 879 teams competing in this year’s competition. Simultaneously, the rules for this years competition were made available. This year’s competition is called “Arial Assist” and comprises moving a 2′ diameter ball between 3 team’s robots (The Alliances will be formed at random during the event) and placing the ball through either a low target (1 point) or a high target (10 points) at either end of a 54′ x 25′ court. We were then randomly dispersed into class rooms at the High School where we brainstormed ideas for the competition. My session seemed to focus most on interpretations of the rules and the possible strategies you could use based on these constraints. Others were more technically based and still others that I heard about from our team members focused more on veterans of FRC competitions comparing this competition to previous ones. These breakouts lasted until about 11:00 and then it was time for teams to get assistance in actually building their kits. Unfortunately we did not get our parts kit today so we took over a class room to strategize and organize a bit. Our coach Brian Tugade (in the hat) has been in these competitions before and a few of the team were in his class last year. This is an advantage that many teams do not have and should help ease the process. We decided that each team member should spend the time between now and next Saturday familiarizing themselves with the rules and thinking of ideas for the competition. We’ll meet again at DigiPen next Saturday to put our ideas together and begin the design process. It will be very important to have ALL the L&E students present at that Saturday afternoon meeting. 2014 FIRST Kickoff Broadcast is available on Youtube at the FRCTeamsGlobal channel.